For use of the term in linguistics and philology, see Comparative method (linguistics), Historical linguistics, Proto-language, and Textual criticism. "Common ancestor" redirects here. For use of the term in graph theory, see Lowest common ancestor. Common descent describes how, in evolutionary biology, a group of organisms share a most recent common ancestor. 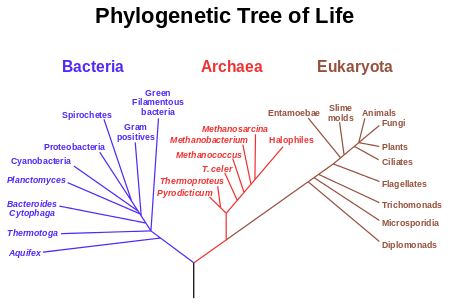 There is evidence of common descent that all life on Earth is descended from the last universal common ancestor (LUCA). In July 2016, scientists reported identifying a set of 355 genes from the LUCA of all organisms living on Earth. Common ancestry between organisms of different species arises during speciation, in which new species are established from a single ancestral population. 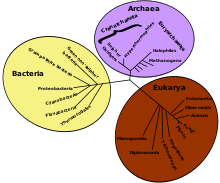 Organisms which share a more recent common ancestor are more closely related. The most recent common ancestor of all currently living organisms is the last universal ancestor, which lived about 3.9 billion years ago. The two earliest evidences for life on Earth are graphite found to be biogenic in 3.7 billion-year-old metasedimentary rocks discovered in western Greenland and microbial mat fossils found in 3.48 billion-year-old sandstone discovered in Western Australia. All currently living organisms on Earth share a common genetic heritage (universal common descent), with each being the descendant from a single original species, though the suggestion of substantial horizontal gene transfer during early evolution has led to questions about monophyly of life. Universal common descent through an evolutionary process was first proposed by the English naturalist Charles Darwin in On the Origin of Species (1859), which concluded: "There is grandeur in this view of life, with its several powers, having been originally breathed into a few forms or into one; and that, whilst this planet has gone cycling on according to the fixed law of gravity, from so simple a beginning endless forms most beautiful and most wonderful have been, and are being, evolved." Axis scale: millions of years. May we not say that, in the fortuitous combination of the productions of Nature, since only those creatures could survive in whose organizations a certain degree of adaptation was present, there is nothing extraordinary in the fact that such adaptation is actually found in all these species which now exist? Chance, one might say, turned out a vast number of individuals; a small proportion of these were organized in such a manner that the animals' organs could satisfy their needs. A much greater number showed neither adaptation nor order; these last have all perished.... Thus the species which we see today are but a small part of all those that a blind destiny has produced. In 1790, Immanuel Kant wrote in Kritik der Urteilskraft (Critique of Judgement) that the analogy of animal forms implies a common original type, and thus a common parent. [W]ould it be too bold to imagine, that in the great length of time, since the earth began to exist, perhaps millions of ages before the commencement of the history of mankind, would it be too bold to imagine, that all warm-blooded animals have arisen from one living filament, which the great First Cause endued with animality, with the power of acquiring new parts attended with new propensities, directed by irritations, sensations, volitions, and associations; and thus possessing the faculty of continuing to improve by its own inherent activity, and of delivering down those improvements by generation to its posterity, world without end? Therefore I should infer from analogy that probably all the organic beings which have ever lived on this earth have descended from some one primordial form, into which life was first breathed. All known forms of life are based on the same fundamental biochemical organization: genetic information encoded in DNA, transcribed into RNA, through the effect of protein- and RNA-enzymes, then translated into proteins by (highly similar) ribosomes, with ATP, NADPH and others as energy sources, etc. Furthermore, the genetic code (the "translation table" according to which DNA information is translated into proteins) is nearly identical for all known lifeforms, from bacteria and archaea to animals and plants. The universality of this code is generally regarded by biologists as definitive evidence in favor of the theory of universal common descent. Analysis of the small differences in the genetic code has also provided support for universal common descent. An example would be Cytochrome c which most organisms actually share. A statistical comparison of various alternative hypotheses has shown that universal common ancestry is significantly more probable than models involving multiple origins. Similarities which have no adaptive relevance cannot be explained by convergent evolution, and therefore they provide compelling support for the theory of universal common descent. Such evidence has come from two areas: amino acid sequences and DNA sequences. Proteins with the same three-dimensional structure need not have identical amino acid sequences; any irrelevant similarity between the sequences is evidence for common descent. In certain cases, there are several codons (DNA triplets) that code for the same amino acid. Thus, if two species use the same codon at the same place to specify an amino acid that can be represented by more than one codon, that is evidence for a recent common ancestor. The universality of many aspects of cellular life is often pointed to as supportive evidence to the more compelling evidence listed above. These similarities include the energy carrier adenosine triphosphate (ATP), and the fact that all amino acids found in proteins are left-handed. It is, however, possible that these similarities resulted because of the laws of physics and chemistry, rather than universal common descent and therefore resulted in convergent evolution. 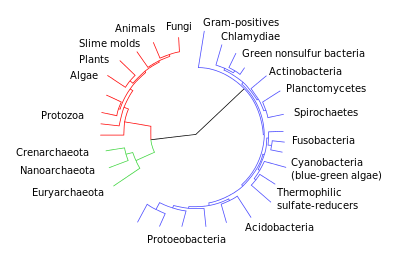 A phylogenetic tree based on rRNA genes. Another important piece of evidence is that it is possible to construct detailed phylogenetic trees (i.e., "genealogic trees" of species) mapping out the proposed divisions and common ancestors of all living species. In 2010, Douglas L. Theobald published a statistical analysis of available genetic data, mapping them to phylogenetic trees, that gave "strong quantitative support, by a formal test, for the unity of life." It should be noted, however, that the "formal test" was criticised for not including consideration of convergent evolution, and Theobald has defended the method against this claim. Traditionally, these trees have been built using morphological methods, such as appearance, embryology, etc. Recently, it has been possible to construct these trees using molecular data, based on similarities and differences between genetic and protein sequences. All these methods produce essentially similar results, even though most genetic variation has no influence over external morphology. That phylogenetic trees based on different types of information agree with each other is strong evidence of a real underlying common descent. For more details on this topic, see Evidence of common descent. Artificial selection demonstrates the diversity that can exist among organisms that share a relatively recent common ancestor. In artificial selection, humans selectively direct the breeding of one species at each generation, allowing only those organisms that exhibit desired characteristics to reproduce. These characteristics become increasingly well-developed in successive generations. Artificial selection was successful long before science discovered the genetic basis. 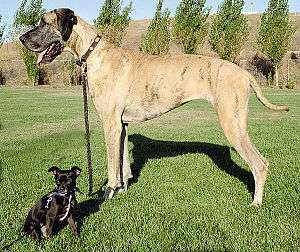 The Chihuahua mix and Great Dane both share a common ancestor, the wolf, but show the power of artificial selection to create diversity of form in a relatively short period of time. The diversity of domesticated dogs is an example of the power of artificial selection. All breeds share common ancestry, having descended from wolves. Humans selectively bred them to enhance specific characteristics, such as color and length or body size. This created a range of breeds that include the Chihuahua, Great Dane, Basset Hound, Pug, and Poodle. Wild wolves, which did not undergo artificial selection, are relatively uniform in comparison. Early farmers cultivated many popular vegetables from the Brassica oleracea (wild cabbage) by artificially selecting for certain attributes. Common vegetables such as cabbage, kale, broccoli, cauliflower, kohlrabi and Brussels sprouts are all descendants of the wild cabbage plant. Brussels sprouts were created by artificially selecting for large bud size. Broccoli was bred by selecting for large flower stalks. Cabbage was created by selecting for short petioles. Kale was bred by selecting for large leaves. Natural selection is the evolutionary process by which heritable traits that increase an individual's fitness become more common, and heritable traits that decrease an individual's fitness become less common. 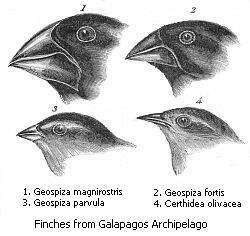 During his studies on the Galápagos Islands, Charles Darwin observed 13 species of finches that are closely related and differ most markedly in the shape of their beaks. The beak of each species is suited to the food available in its particular environment, suggesting that beak shapes evolved by natural selection. Large beaks were found on the islands where the primary source of food for the finches are nuts and therefore the large beaks allowed the birds to be better equipped for opening the nuts and staying well nourished. Slender beaks were found on the finches which found insects to be the best source of food on the island they inhabited; their slender beaks allowed the birds to be better equipped for pulling out the insects from their tiny hiding places. The finch is also found on the main land and it is thought that they migrated to the islands and began adapting to their environment through natural selection. 1 2 3 4 5 Theobald, Douglas L. (13 May 2010). "A formal test of the theory of universal common ancestry". Nature. London: Nature Publishing Group. 465 (7295): 219–222. doi:10.1038/nature09014. ISSN 0028-0836. PMID 20463738. 1 2 Steel, Mike; Penny, David (13 May 2010). "Origins of life: Common ancestry put to the test". Nature. London: Nature Publishing Group. 465 (7295): 168–169. doi:10.1038/465168a. ISSN 0028-0836. PMID 20463725. ↑ Wade, Nicholas (25 July 2016). "Meet Luca, the Ancestor of All Living Things". New York Times. Retrieved 25 July 2016. ↑ Doolittle, W. Ford (February 2000). "Uprooting the Tree of Life" (PDF). Scientific American. Stuttgart: Georg von Holtzbrinck Publishing Group. 282 (2): 90–95. doi:10.1038/scientificamerican0200-90. ISSN 0036-8733. PMID 10710791. Archived from the original (PDF) on 2006-09-07. Retrieved 2015-11-22. ↑ Glansdorff, Nicolas; Ying Xu; Labedan, Bernard (9 July 2008). "The Last Universal Common Ancestor: emergence, constitution and genetic legacy of an elusive forerunner". Biology Direct. London: BioMed Central. 3: 29. doi:10.1186/1745-6150-3-29. ISSN 1745-6150. PMC 2478661 . PMID 18613974. ↑ Ohtomo, Yoko; Kakegawa, Takeshi; Ishida, Akizumi; et al. (January 2014). "Evidence for biogenic graphite in early Archaean Isua metasedimentary rocks". Nature Geoscience. London: Nature Publishing Group. 7 (1): 25–28. Bibcode:2014NatGe...7...25O. doi:10.1038/ngeo2025. ISSN 1752-0894. ↑ Borenstein, Seth (13 November 2013). "Oldest fossil found: Meet your microbial mom". Excite. Yonkers, NY: Mindspark Interactive Network. Associated Press. Retrieved 2015-11-22. ↑ Noffke, Nora; Christian, Daniel; Wacey, David; Hazen, Robert M. (16 December 2013). "Microbially Induced Sedimentary Structures Recording an Ancient Ecosystem in the ca. 3.48 Billion-Year-Old Dresser Formation, Pilbara, Western Australia". Astrobiology. New Rochelle, NY: Mary Ann Liebert, Inc. 13 (12): 1103–1124. doi:10.1089/ast.2013.1030. ISSN 1531-1074. PMC 3870916 . PMID 24205812. ↑ Kant 1987, p. 304: "Despite all the variety among these forms, they seem to have been produced according to a common archetype, and this analogy among them reinforces our suspicion that they are actually akin, produced by a common original mother." ↑ Knight, Robin; Freeland, Stephen J.; Landweber, Laura F. (January 2001). "Rewiring the keyboard: evolvability of the genetic code". Nature Reviews Genetics. London: Nature Publishing Group. 2 (1): 49–58. doi:10.1038/35047500. ISSN 1471-0056. PMID 11253070. ↑ Than, Ker (14 May 2010). "All Species Evolved From Single Cell, Study Finds". National Geographic News. Washington, D.C.: National Geographic Society. Retrieved 2011-10-30. ↑ Yonezawa, Takahiro; Hasegawa, Masami (16 December 2010). "Was the universal common ancestry proved?". Nature. London: Nature Publishing Group. 468 (7326): E9. doi:10.1038/nature09482. ISSN 1476-4687. PMID 21164432. ↑ Theobald, Douglas L. (16 December 2010). "Theobald reply". Nature. London: Nature Publishing Group. 468 (7326): E10. doi:10.1038/nature09483. ISSN 1476-4687. ↑ Theobald, Douglas L. (24 November 2011). "On universal common ancestry, sequence similarity, and phylogenetic structure: The sins of P-values and the virtues of Bayesian evidence". Biology Direct. London: BioMed Central. 6 (1): 60. doi:10.1186/1745-6150-6-60. ISSN 1745-6150. PMC 3314578 . PMID 22114984. ↑ Theobald, Douglas L. "Prediction 1.3: Consilience of independent phylogenies". 29+ Evidences for Macroevolution: The Scientific Case for Common Descent. Version 2.89. Houston, TX: The TalkOrigins Foundation, Inc. Retrieved 2009-11-20. ↑ Raven, Evert & Eichhorn 2005, p. 200: "[These vegetables were] all produced from a single species of plant (Brassica oleracea), a member of the mustard family." Crombie, A. C.; Hoskin, Michael (1970). "The Scientific Movement and the Diffusion of Scientific Ideas, 1688–1751". In Bromley, J. S. The Rise of Great Britain and Russia, 1688–1715/25. The New Cambridge Modern History. 6. London: Cambridge University Press. ISBN 0-521-07524-6. LCCN 57014935. OCLC 7588392. Darwin, Charles (1859). On the Origin of Species by Means of Natural Selection, or the Preservation of Favoured Races in the Struggle for Life (1st ed.). London: John Murray. LCCN 06017473. OCLC 741260650. The book is available from The Complete Work of Charles Darwin Online. Retrieved 2015-11-23. Darwin, Erasmus (1818) [Originally published 1794]. Zoonomia; or the Laws of Organic Life. 1 (4nd American ed.). Philadelphia, PA: Edward Earle. Zoonomia; or The laws of organic life: in three parts (Volume 1) (1818) on the Internet Archive Retrieved 2015-11-23. Harris, C. Leon (1981). Evolution: Genesis and Revelations: With Readings from Empedocles to Wilson. Albany, NY: State University of New York Press. ISBN 0-87395-487-4. LCCN 81002555. OCLC 7278190. Kant, Immanuel (1987) [Originally published 1790 in Prussia as Kritik der Urteilskraft]. Critique of Judgment. Translated, with an introduction, by Werner S. Pluhar; foreword by Mary J. Gregor. Indianapolis, IN: Hackett Publishing Company. ISBN 0-87220-025-6. LCCN 86014852. OCLC 13796153. Raven, Peter H.; Evert, Ray F.; Eichhorn, Susan E. (2005). Biology of Plants (7th ed.). New York: W. H. Freeman and Company. ISBN 0-7167-1007-2. LCCN 2004053303. OCLC 183148564. Treasure, Geoffrey (1985). The Making of Modern Europe, 1648-1780. New York: Methuen. ISBN 0-416-72370-5. LCCN 85000255. OCLC 11623262. 29+ Evidences for Macroevolution: The Scientific Case for Common Descent from the TalkOrigins Archive.